Choosing a Plan - 5Cs. Making the right Medicare plan decision may get you the healthcare you want and also save you a tremendous amount of frustration, stress and money. Each year, Medicare plan costs and benefits change, so it’s important to research your options and know what’s important for your healthcare. How do you decide which Medicare plan is right for you? Consider these factors when choosing a Medicare plan. 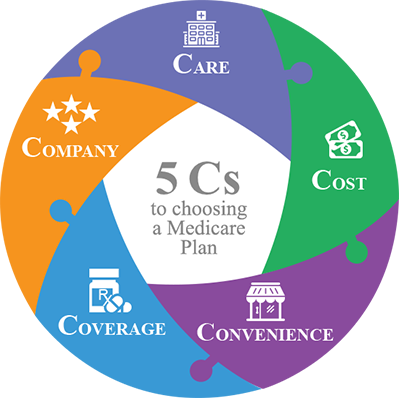 We call them the essential 5Cs to confidently choosing a Medicare plan. Most plans will not cover all of your health care expenses. You will have to pay a share of the costs for the care you receive. 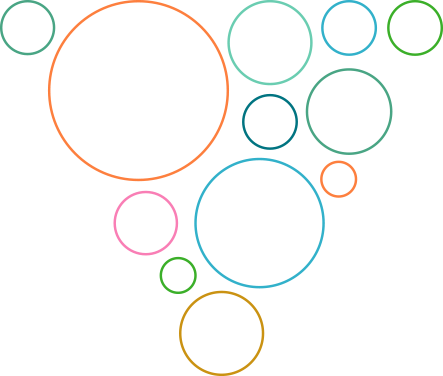 Ask how well a health plan covers the services and care you need for the cost you can afford. Check the plan’s total cost, not just the monthly premium. Other costs to consider are deductibles, co-pays, and co-insurance. Also, look at out-of-pocket maximums, or the most you will pay for care in a year. Enrolling in a low cost plan may not be the right decision if the health care or services that you need are not covered. Compare the care and services provided in each plan to make sure a plan is right for you. Don’t be afraid to ask specific questions about the care and services covered and what your share of costs may be. Discuss the plan you are considering with the doctors or specialist you regularly see, and ask if they accept Medicare coverage and are in network with the plans you are considering. Know how well you will be covered by your Medicare plan for medical care and prescription drugs, and determine whether you will need additional coverage. Ask how well the plan covers the services you need. Will you have coverage in another state or country? Are there coverage rules or limitations that apply to your prescriptions? Consider any trade-offs you may have to make in choosing a Medicare plan. Many people have long-term relationships with a preferred doctor and pharmacy. Some plans may require you to change doctors or pharmacies. For most people, finding a plan that allows them to stay with their doctor and pharmacy is important. You’ll need to decide what’s most important to you and your medical care. Not all health plans are created equal, and the doctors, hospitals and facilities you choose can impact your health.